Having a compliant background screening program can be challenging, but our compliance resource kit makes it easy by highlighting key considerations for your organization. To access our resource kit, simply complete the form below. 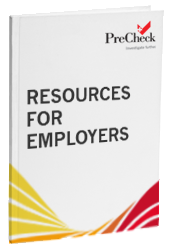 Don’t take any chances with our Compliance resource kit, which highlights what employers need to know before running background checks for employment purposes. Background screening mistakes can be costly for employers from knowing when to use credit reports to what to do after a background check report with a criminal hit. Learn how to avoid these and other mistakes with our resource kit.